A quick & easy way to calculate nutritional information labels for your recipes. "Nutrition facts could surprise you"
What I like best about this product is that it allows the user to make his or her own nutrition labels without the use of a nutrition lab. This is now government required information to be placed on food packaging. This information can sometimes become tricky (complicated to figure out). For example, what specific information is being asked for. It provides food producers (cooks, bakers, caterers, etc) with the ability to produce their own nutrition labels which are now government required. It also allows the cook to realize just how healthy or unhealthy the products they are producing are. Therefore adjustments can be made. 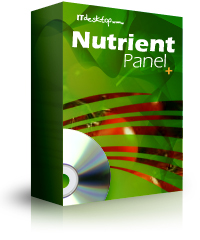 * We monitor all Nutrient-Panel+ reviews to prevent fraudulent reviews and keep review quality high. We do not post reviews by company employees or direct competitors. Validated reviews require the user to submit a screenshot of the product containing their user ID, in order to verify a user is an actual user of the product. Hi there! Are you looking to implement a solution like Nutrient-Panel+?